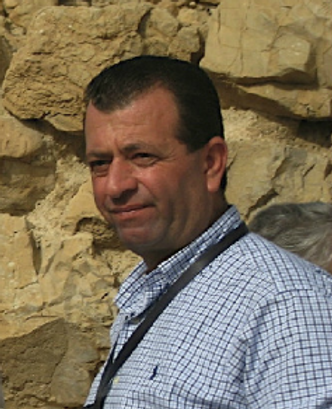 Iyad Qumri, our host and guide in the Holy Land, is an Arab Palestinian Christian and a citizen of Israel. A lifelong Anglican, Iyad is an active member of St. George’s Cathedral in Jerusalem, and a canon of the Episcopal Diocese of Los Angeles. (In this context, “canon” is an honorary title given by a bishop in recognition of faithful service to the church.) Iyad and his wife Simone have homes in Jerusalem and Jericho, and his two sons, Sami and Rami, graduated from college in the United States. Iyad has more than 20 years of experience as a licensed private guide in Israel. Though most of his work has been with Episcopal/Anglican pilgrims, he has guided groups of Methodists and Roman Catholics, including former Los Angeles Cardinal Roger Mahony. Among the hundreds of pilgrims Iyad has guided are bishops Jon Bruno (Los Angeles); Diane Bruce (Los Angeles); George Councell (New Jersey); Andrew Dietsche (New York); Alan Gates (Massachusetts); Mary Glasspool (Los Angeles); Michael Hanley (Oregon); Gayle Harris (Massachusetts); Katharine Jefferts Schori (former Presiding Bishop); Ed Konieczny (Oklahoma); Sean Rowe (Northwest Pennsylvania); Morris Thompson (Louisiana); and the brothers of the Society of St. John the Evangelist. Since early 2014, Iyad has been assisted by the Rev. Canon Mark E. Stanger, who had served for more than a decade at Grace Cathedral, San Francisco, and has led many Episcopal Church pilgrimages to the Holy Land from there and through St. George’s College. Iyad has an astounding number of cousins throughout the Holy Land.